A joint study from researchers at Duke University and the Environmental Working Group (EWG) found that a suspected endocrine-disrupting chemical in many popular nail polishes was also found in the bodies of women who had painted their nails with polishes containing the substance. Even though the study was small — conducted on 26 women — the researchers discovered that two to six hours after they painted their nails, 24 of the 26 volunteers in the study had slightly elevated levels of a form of triphenyl phosphate called diphenyl phosphate (DPHP) in their urine. But ten to 14 hours after they polished their nails, the DPHP levels of all 26 participants had risen by an average of nearly sevenfold, suggesting that more of the TPHP had entered their bodies and been metabolized into DPHP. TPHP is a known plasticizer (it makes products more flexible and less brittle), and it is also used as a fire retardant in furniture. Here’s a full list of the affected brands and products. While everyone has some level of TPHP in their body, study co-author Kate Hoffman, a researcher at Duke University, tells Yahoo Health that the levels found in women who painted their nails were “substantially higher” than those typically found in the general population. 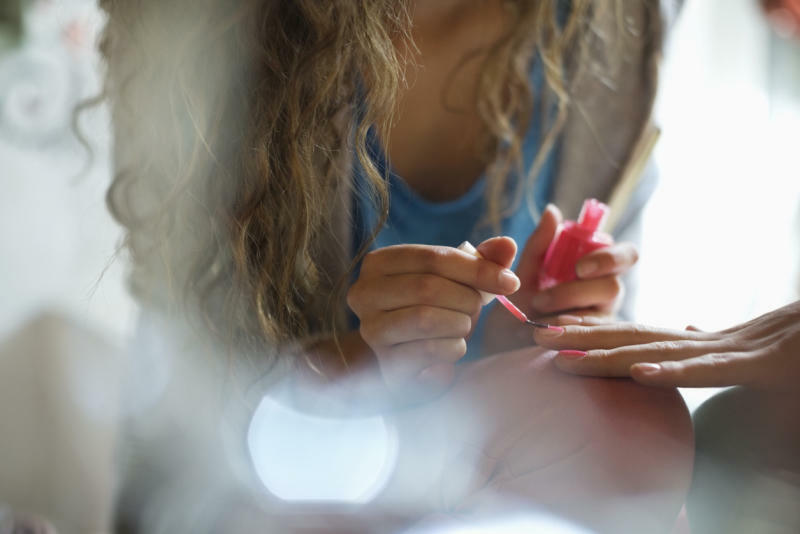 Johanna Congleton, a senior scientist with EWG who also worked on the study, tells Yahoo Health that nail polish can be a “significant source” of short-term TPHP exposure, as well as a source of chronic exposure for people who use it frequently. Interestingly, the data from the study suggested that the levels of TPHP may be higher in clear polishes than colored polishes. “As clear nail polishes are often used as a base coat or top coat, some individuals may be simultaneously exposed to TPHP in both colored polish and clear polish,” Hoffman and her colleagues noted in the study. But they went on to caution that — due to the small study sample size — to not overly-interpret this finding. Researchers conducted two sets of experiments to find out whether the TPHP was inhaled or absorbed, and found levels of DPHP did not increase significantly when women didn’t apply the polish directly to their own nails. “Nails aren’t permeable to most molecules, but TPHP could be absorbed into the cuticle or around the nail,” says Congleton. It’s also possible that hand-to-mouth contact may result in incidental ingestion of TPHP following nail polish application, particularly for individuals biting their nails. But what does this mean for your health? Experts aren’t sure. Here’s what they do know: Several lab studies have found that exposure to TPHP caused endocrine disruption and, in animal studies, TPHP exposure caused reproductive and developmental issues. According to the National Institute of Environmental Health Sciences (NIH), endocrine disruptors are chemicals that may interfere with the body’s endocrine system. Previous research has found endocrine disruptors to play a role in infertility, hormone-related cancers (such as breast and ovarian cancer), prostate conditions, thyroid disorders, neurological issues, diabetes, and even obesity. “We don’t have a lot of human data, but the scarce data that we do have indicates that it might disrupt the endocrine system,” Congleton says. Many brands list TPHP as an ingredient on their packaging, but Hoffman notes that they tested several brands that contained TPHP but didn’t have it listed as an ingredient. So, should you stop painting your nails altogether? Hoffman is hesitant to go that far, but urges consumers to be cautious. If you plan to paint your nails, Hoffman recommends avoiding brands that list TPHP as an ingredient — just be aware that it doesn’t mean your polish is TPHP-free. She also advises that you avoid the cuticle and surrounding skin as much as possible to try to minimize absorption.